This is a comprehensive list of bat removal and bat control companies in Iowa. These companies follow best practices when performing IA bat removal, bat proofing, bat guano removal and disposal, and bat bug treatment and extermination if needed. 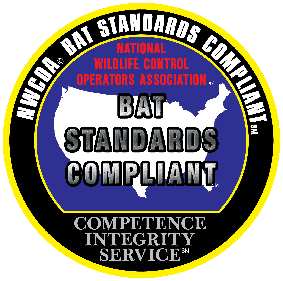 We ask that all bat removal companies in Iowa operate in accordance with NWCOA Bat Standards, remove bats humanely, and don’t remove bats during the bat birthing season. All bat removal companies in Iowa should be properly licensed, guarantee their work, and carry required levels of liability and workers’ compensation insurance. We try to ensure that all Iowa bat removal companies appearing on this website are the area’s best local company for getting rid of bats. If you have bats in your attic, a bat in your house, or bats in your home’s vents, give us a call to connect with a bat removal professional in your area. Our Iowa bat removal companies are experts at getting rid of bats in Iowa and keeping them out. Bat guano removal in Iowa should only be performed by companies with the training and equipment needed for safe removal and disposal. Bat bug extermination and treatment in Iowa should only be performed by trained professionals. Bat control in Iowa can be difficult at times. There are many different techniques and approaches that can be utilized depending on your particular bat removal needs. We recommend only using Iowa bat removal professionals to get rid of your bats. Bats like other mammals are associated with certain diseases that may be transferable to humans. The main problems associated with bats are rabies, histoplasmosis, bat bugs, and the damaged caused by allowing bats to remain in Iowa structures. If you’re looking for the area’s top rated company to get rid of bats that have taken up residence in your home or business, give us a call. Let our bat removal specialist in Dubuque Iowa solve your bat problem today. If you’re looking for the area’s top rated Davenport Iowa Bat Removal specialist to remove bats in your attic or other locations on a structure in Davenport, Iowa or surrounding areas, give us a call at (800) 928-4057.